addresses a problem all parents experience. 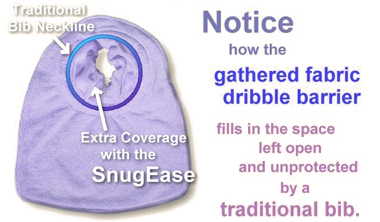 The patented SnugEase™ Bib has added absorbent fabric within the traditional neckline of a bib to provide for a snug fit with extensive surface area for dribble absorption. 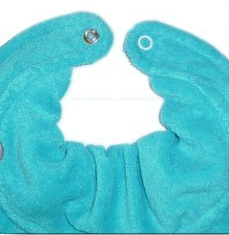 This extra fabric snugly fits the baby through the use of an oversized hoop of memory material inserted into the bib's arms. 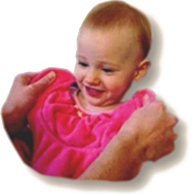 This inventive design creates the best fitting and easiest placing bib available today! 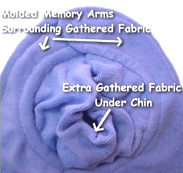 Memory Arms™ It is the combination of these unique features that give the SnugEase™ Bib such a snug and absorbent fit. 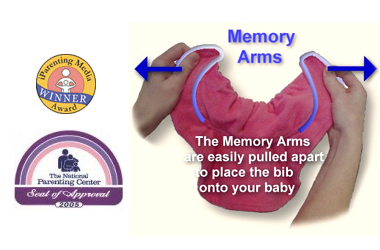 Memory Arms™ are bib arms that retains their shape. You may pull apart the arms and upon release they then will return to their original shape. Memory Arms™ are the reason you don't need to use fasteners. 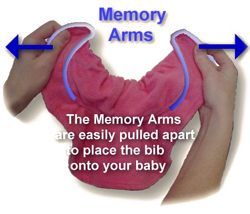 When you are placing the SnugEase™ Bib on your baby, grasp each Memory Arm™, one in each of your hands, and pull them apart. 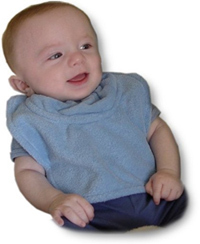 Place the inner neckline of the SnugEase™ Bib against your baby's neck and then slowly release the Memory Arms™. to overlap behind the neck draws the front of the neckline with its gathered fabric into a snug, safe and comfortable fit with your baby's neck. The front of the neckline can even be positioned to protect turtleneck and collared shirts. 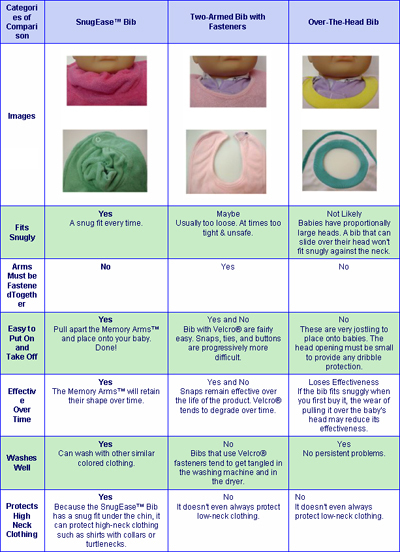 Then, when you are ready, it is just as easy to remove the bib from the baby. Grasp the Memory Arms, one in each hand, and pull outward. so why is there a snap? We have added a snap for parents who want to secure the bib, not because the SnugEase™ Bib needs a snap to stay on a baby. We added the Secure Snap in response to customer feedback. We had received many comments from parents that their babies became aware of their bib around 8-12 months and started pulling it off. If as your baby grows she begins to display her independence by pulling off her SnugEase™ Bib, the Secure Snap is now there to hold the bib in place. And as always, for the younger babies, and the older babies who don't disturb their bibs,you don't have to do anything with the Secure Snap. Just ignore it. 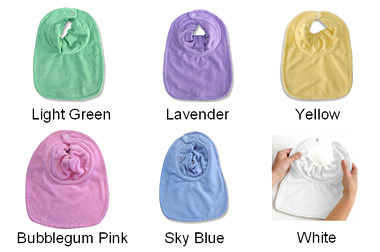 Compare the SnugEase™ Bib with two other types of bibs.